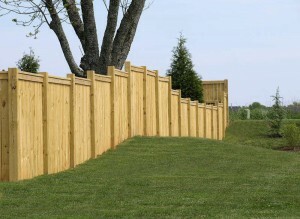 With winter in our rearview mirror, now is the time for maintenance for wood fences in Richmond. The aesthetic appeal of a wooden fence is undeniable but a wooden fence does require regular maintenance for it to keep that appeal. A wooden fence can last as long as 30 years if the wood is treated, but every fence is still vulnerable to damage. A beautiful new wood fence in Richmond. The weather can sometimes bring on surprises that people aren’t expecting, and extreme weather can do a number on your wood fence in Richmond. Rain, snow and heavy wind are not kind to wooden fences and homeowners are shocked to see what some of the weather from the winter and spring has done to their fences. Also, insects will sometimes like to make a home in your wooden fence, which causes premature damage. While there are only a few culprits of damage to wooden fences the results can truly be devastating. Dry or Wet Rot- When you notice your fence has dry or wet rot, you should cut out the affected pieces. Depending on the extent of the damage, you will need to either patch or replace the rotted wood. Don’t feel bad if this is a little past your skill level. A professional fence service will know how to get your wooden fence in Richmond looking pristine once again. Insect Damage- Termites are the major culprit of most insect fence damages. They love the moisture that can slip in the cracks of some fences, so once the fence is repaired you will need to make sure to prevent excessive moisture from entering your fence. Sagging Posts- Sagging posts can result from issues with the post or the hole for the fence. The post may be able to be splintered off if it is rotted but with serious rot you will need to completely replace the post. If you have an issue with the whole, you can either use crushed stone or concrete to support the fence. Again, a trusty fence service will be able to handle issues you may not feel comfortable tackling yourself. Check the integrity of the structure of your fence before paying for patchwork. If the fence is on it’s last legs, it is better to do a complete overhaul than to waste money on a slap-dash solution. Whether you need a new fence or just have questions about repairs, you’ll want to work with a company in Richmond that is know for expertise and craftsmanship. This entry was posted on Thursday, May 28th, 2015 at 8:28 pm. Both comments and pings are currently closed.